Mcphail's Auto Sales has a wide selection of exceptional pre-owned vehicles to choose from, including this 2003 Ford F-150. Your buying risks are reduced thanks to a CARFAX BuyBack Guarantee. It's not often you find just the vehicle you are looking for AND with low mileage. This is your chance to take home a gently used and barely driven Ford F-150. 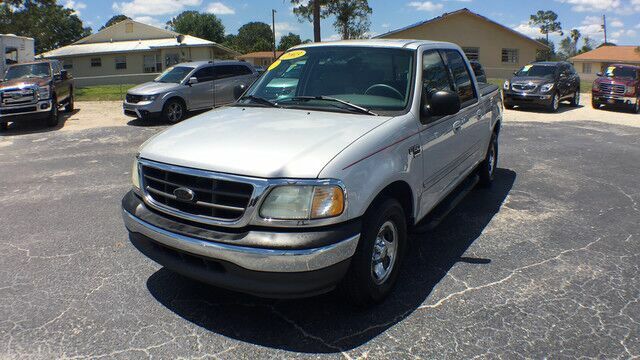 If not for a few miles on the odometer you would be hard-pressed to know this 2003 Ford F-150 is a pre-owned vehicle. Beautiful color combination with Dark Shadow Grey Metallic exterior over Medium Graphite interior making this the one to own! Mcphail's Auto Sales has a wide selection of exceptional pre-owned vehicles to choose from, including this 2011 Hyundai Sonata. Your buying risks are reduced thanks to a CARFAX BuyBack Guarantee. If you're going to purchase a pre-owned vehicle, why wouldn't you purchase one with CARFAX one-owner report. This 2011 Hyundai Sonata has great acceleration and wonderful styling without sacrificing exceptional fuel economy. One of the best things about this Hyundai Sonata is that it has low, low mileage. It's ready for you to truly break it in. With complete historical records, you'll know your next pre-owned vehicle, like this one, inside and out before you purchase it. Rare is the vehicle that has been driven so gently and maintained so meticulously as this pre-owned beauty. You'd swear you were at a live concert every time you fire up the premium entertainment package in this vehicle. When all factors are equal, choose a vehicle equipped with a factory warranty like this gently driven gem. Stupendously fast, yet subtle at the same time, this Hyundai Sonata GLS sets the bar high. A true automotive masterpiece, this Hyundai can function on track-day or work-day, and will always get you to your destination very quick. Equipped with many extra features, this well-appointed vehicle is a treat to drive. Marked by excellent quality and features with unmistakable refined leather interior that added value and class to the Hyundai Sonata Enjoy the drive without worrying about directions thanks to the built-in navigation system. Tires can be an expensive maintenance item. Luckily, this vehicle's tires are newly installed, so you've got miles and miles to go before you need to replace them. When you see this car in person, you'll ask yourself "When did WOW become a color of paint?" This unbelievably rare Hyundai Sonata GLS is a perfect example of "The Best Man Can Build." Hyundai has put longtime mid-size best-sellers, including the Honda Accord and Toyota Camry, directly into its sites with the all-new Sonata. Hyundai meets or exceeds those models in most respects. With new EPA fuel economy ratings of up to 24 mpg city, 35 highway, thanks to a new direct-injection 4-cylinder engine, the Sonata has fuel-efficiency and power performance numbers that are both better than most base-model mid-size sedans. The 2011 Sonata is now classified by the EPA as a large car, and has more passenger room than most of its competitors, while it has significantly more trunk space than the Toyota Camry, Nissan Altima, Ford Fusion and Chevrolet Malibu. The Sonata is also lighter than almost all of its rivals and has a short 35.8-foot turning diameter that's also shorter than most other mid-size sedans. The Sonata also has a trump card in safety, as it's already been named a Top Safety Pick by the IIHS. Mcphail's Auto Sales has a wide selection of exceptional pre-owned vehicles to choose from, including this 2006 Saturn VUE. This Saturn includes: 3.5L SOHC MFI 24-VALVE V6 ENGINE (STD) V6 Cylinder Engine Gasoline Fuel OMNI LEATHER SEATING SURFACES Leather Seats 5-SPEED AUTOMATIC TRANSMISSION W/OD (STD) 5-Speed A/T A/T FEDERAL EMISSIONS P245/50R18 PERFORMANCE BSW TIRES Tires - Front Performance Tires - Rear Performance AM/FM STEREO W/CD PLAYER CD Player AM/FM Stereo STANDARD PAINT (STD) *Note - For third party subscriptions or services, please contact the dealer for more information. * Drive home in your new pre-owned vehicle with the knowledge you're fully backed by the CARFAX Buyback Guarantee. This Saturn VUE defines excellence in an SUV. It has the convenience of limitless boundaries paired with city sophistication. The incredibly low mileage and painstaking upkeep on this Saturn VUE makes it a once-in-a-lifetime deal that won't last long! Call us today to reserve your test drive! Marked by excellent quality and features with unmistakable refined leather interior that added value and class to the Saturn VUE Feel at ease with your purchase of this Saturn VUE , all records are included allowing you to truly know what you're buying. Rare is the vehicle that has been driven so gently and maintained so meticulously as this pre-owned beauty. Feel pleased in your decision to buy this Saturn VUE as it's still covered under the manufacturer's warranty. The new tires on this Saturn VUE are the ultimate complement to an already exquisite vehicle. This car has an exceptional paint finish that shows no sign of age or wear. Stand out from the crowd as a 2006 Saturn VUE is a rare find and just may attract paparazzi.